Sometimes we can get so wrapped up in making sure our RVs are in tip-top shape before hitting the road that thinking about our own health care once we're actually on the road falls by the wayside. That is, until it's too late. What kind of medical records you should keep and be carrying while RVing? Also in this episode of Roadtreking, we talk about a beer-drinking bear (an old story), an expansion of a beautiful campground in Florida, a new feature from Jennifer, listener questions about solar power, a traveling tech tip to make managing streaming media easier, an off the beaten path report from Colorado, and more! 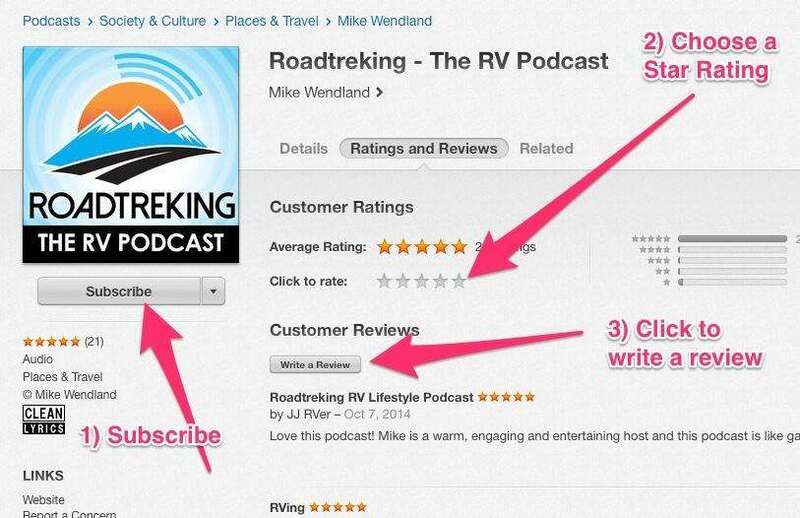 This new feature for the Roadtreking podcast will feature a weekly tip from Mike Wendland's wife (and lifelong travelling companion), Jennifer. Sometimes Jennifer will just pass along something she’s learned or seen that makes the RV lifestyle a little more fun or easy. Sometimes it might be a recipe. Or sometimes, like in this episode, Jennifer will talk about a product or accessory that other RVers may benefit from. Listener Question: Should We Believe the Hype Over Solar Power for RVing? Listener Question: How Long can You Run Your Air Conditioning and Refrigerator? Sponsoring this part of the podcast is Van City RV in St. Louis, Mo. Van City RV only sells Class B. RVs. Owner Ray Dwyer has been in the RV business for 44 years and is considered the dean of Class B RVs. Nobody knows more about small motorhomes that Ray and his crew. They have new and used Class B motorhomes in stock from the major manufacturers. When you fly in to buy your RV from Van City, they'll arrange to have you picked up from the airport and will reimburse you $500 toward your airfare. Then, your RV will be fully prepared for travel, complete with full tanks of fuel and propane. After a complete orientation with their staff on your new RV, you can take delivery and set out for home. Dan the Van Man gives the week's specials on the podcast. Beer-Guzzling Black Bear: Another story about bears that is funny, but also illustrates the need to keep food (and beer) locked away when camping in bear country – and also that taste and beer brand loyalty isn't just a human trait. (Read more) [spp-timestamp time=”20:09″] Please note, NBC and the Associated Press ran this story this week. Turns out, it is an old story, first published in 2004. It wasn't corrected until after we had recorded the podcast. Still… it's pretty funny. This portion of the podcast is brought to you by Alde, the only name in heat that you need to know for your RV. The Alde hydronic system brings many features and benefits not found with any other product. Increased Interior Space by combining two systems in one. Efficiency. The whole system draws less than 1 amp on 12V DC and will extend the life of your propane roughly 40% over forced air. Heating on Electric or Gas. Minimal Side-Wall Penetration. Small combined intake and exhaust eliminate big cut outs and sidewall congestion. The good thing about having more streaming media choices like Netflix and Amazon Prime Intstant Video? The amount of content offered. The bad thing? The amount of content offered. That's because there are so many choices, it can be tedious, time-consuming, and just plain hard to find – let alone remember – what to watch. There’s a great way, though, to make sure the media you consume is actually worth consuming. It’s called InstantWatcher. You can go to the website directly or get InstantWatcher apps for iOS and Android. And it’s all completely free. This part of the podcast is brought to you by Leisure Time RV, serving central Florida and the Internet from Winter Garden, Fla.. Leisure Time RV, a family-owned dealership in Winter Garden, Florida, near Orlando has been in business for 45 year and is consistently among the top Roadtrek dealers in North America. They have a full line of the Roadtrek inventory as well as travel trailers and used RVs. Jennifer and I have visited Leisure Time RV and we know the staff and we are very impressed by the honesty, integrity and first rate service we found there. They sell to customers all across the country, wich tells you that they know how to deal. They also offer unparalled RV service and if you are looking for Roadtrek parts, call Leisure Time RV because they also carry a full line of parts which they ship out nationwide..
RT42 Podcast: How to Choose the Right RV for You!